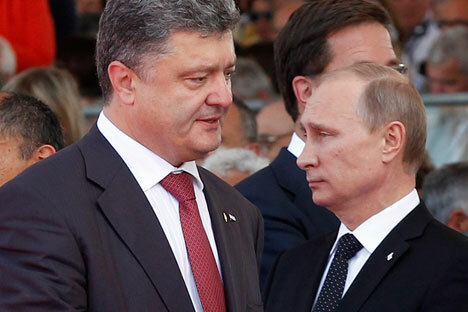 RBTH presents a selection of views from leading Russian media on the latest developments in Ukraine, featuring analysis of Petro Poroshenko’s dissolution of the Ukrainian parliament, the prospects of bilateral Russia-Ukraine talks at upcoming talks in Minsk, and Moscow’s plans to send a second humanitarian convoy to south-eastern Ukraine. The newspaper Moskovsky Komsomolets writes about the early dissolution of the Ukrainian parliament, or Verkhovna Rada. In defense of his decision, the country’s President Petro Poroshenko said that the Rada in its current form “was Yanukovych’s pillar” for a year and a half and accused the deputies of being responsible for the Euromaidan tragedy and for the killing of the “Heavenly Hundred” (the protesters killed in Kiev in the winter of 2014). Moskovsky Komsomolets attributes Poroshenko’s decision to the desire to purge the government body and get rid of deputies that were previously loyal to Yanukovych. At the same time, Poroshenko is unlikely to be able to completely cleanse the parliament of pro-Russian forces. “There is a large group of wealthy representatives of the southeast in the country,” the newspaper writes. Gazeta.ru reports on potential bilateral negotiations between the Russian and Ukrainian presidents at today’s summit in Minsk. However, according to an “informed source,” the decision on whether or not Putin and Poroshenko will actually meet is to be decided on the spot. In Gazeta.ru’s opinion, this is because of provocative maneuvers made by both sides in the lead-up to the summit. On Friday, a Russian humanitarian convoy entered Ukraine to provide aid to Lugansk without Kiev’s permission. On Sunday, Kiev hosted a massive military parade in celebration of Ukrainian Independence Day, at which Poroshenko told the people that “our battle for Ukraine will be successful.” On the same day, militia fighters carried some 100 Ukrainian POWs through the streets of Donetsk. According to Alexei Arbatov, director of the Center for International Security at the Institute of World Economy and International Relations of the Russian Academy of Sciences, all of these events could influence Poroshenko’s position at the meeting in Minsk. “Ukraine feels insulted and is not in a constructive mindset,” Arbatov said. Rossiyskaya Gazeta quotes Russian Foreign Minister Sergei Lavrov regarding the agenda for the meeting in Minsk: “The key issue on the agenda will be to consider economic ties between the Customs Union and Ukraine, between the European Union and Ukraine.” The Kremlin is not ruling out a bilateral meeting between Russian President Vladimir Putin and his Ukrainian counterpart Petro Poroshenko. Meanwhile, Lavrov stressed that neither the EU nor Ukraine should pretend that Moscow should seek a solution to the Ukraine crisis by itself. “I really hope that our Western colleagues in both Minsk and during potential meetings in other formats – be they in Normandy or in Geneva – will come to them not just with the desire for us to miraculously solve everything for them, but will come prepared to influence the Ukrainian side in terms of making it aware of its responsibility for its own country,” Lavrov said. The Russian authorities have announced plans to send a second humanitarian convoy, similar to the first one, to the breakaway Donetsk and Lugansk people’s republics. According to Vzglyad, the self-proclaimed Donetsk People’s Republic was glad to hear about the new batch of humanitarian aid and expressed hope that this time the convoy would be able to pass through not only to Lugansk, but also to Donetsk. Meanwhile, Kiev was upset by the news that a second convoy had been shipped out. “The humanitarian catastrophe in the southeast needs to be resolved not by handouts from Moscow, but through disarming the separatists,” Vzglyad quoted Verkhovna Rada deputy Alexander Brigints as saying.